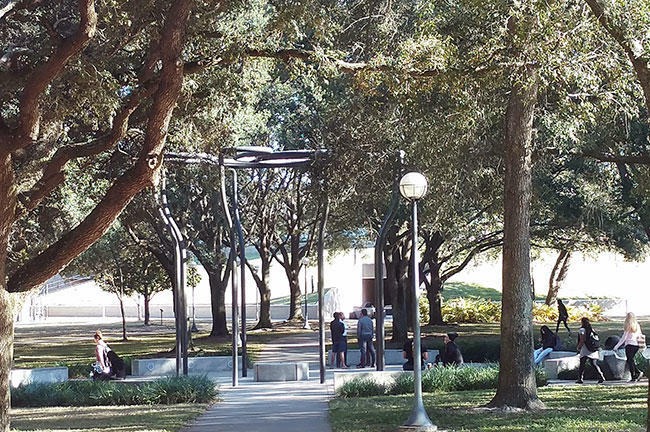 Nancy Holt's "Solar Rotary" is located in a plaza between Cooper Hall and the Communication and Information Sciences Building on USF's Tampa campus. Sarah Howard (far left) from the USF Institute for Research in Art leads a recent walking tour looking at some of USF's public art. As part of WUSF's ongoing look at public art around the Tampa Bay area, we decided to examine a place where about 120 works are scattered over 1,700 acres. 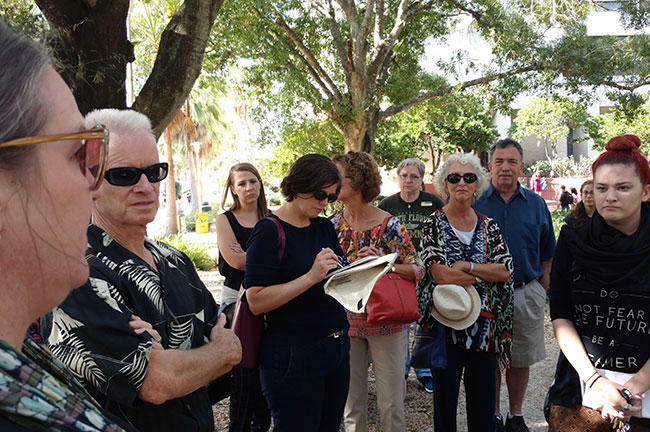 It’s the University of South Florida’s Tampa campus, and we recently joined a Friday lunchtime walking tour that examined a handful of the pieces. “There’s works that incorporate water, there’s works that incorporate interactivity, there’s works that are installed on the surfaces of buildings and in and around those spaces,” said tour guide Sarah Howard, the Curator for Public Art and Social Practice at the USF Institute for Research in Art. Most of the works on the Tampa campus, along with a much smaller number on the St. Petersburg and Sarasota-Manatee campuses, were paid for by Florida’s Art in State Buildings Program. That’s a 1970s legislative effort that sets aside one-half of one percent of any new state construction funds for art that goes in or around a new building. For USF, that comes out to about $1.5 million during the program's history, a sum that’s been augmented by private and in-kind donations. Howard said the nature of the funding is the first reason the tour is open to the public. But more importantly is that it gives people, as well as curious students and faculty, the chance to see not just the art, but parts of campus they might not normally check out. 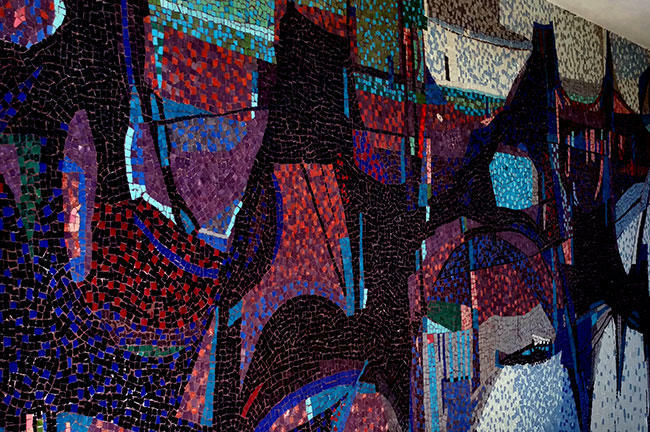 "Forum I," one of Joe Testa-Secca's two mosaic tile murals that have adorned the John and Grace Allen Welcome Center since it was one of the original USF buildings constructed in 1960. The first stop on the tour was the old Administration Building at the end of Leroy Collins Boulevard, the main road into campus. There, a pair of mosaic tile murals, "Forum I" and "Forum II," designed by Tampa native Joe Testa-Secca, adorn the front walls of what’s now the John and Grace Allen Welcome Center. Howard said the murals were installed when the building was built in 1960. While they’re now somewhat obstructed by bushes and other foliage, they’ve held up remarkably well. “As far as maintenance goes, they’re a really great material to have incorporated into the Florida environment, especially an exterior application,” she said. A short walk from the mosaics is another piece of art located on the side of a building – in this case, the Natural and Environmental Science Building. But instead of a mural on the first story, it’s an elevated piece, mounted to the wall and extending four stories into the sky. 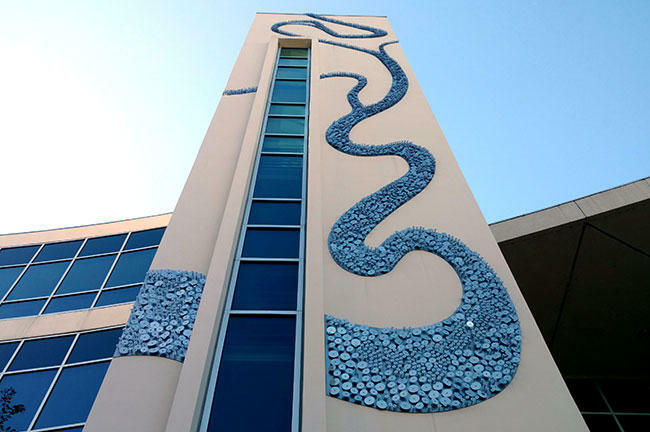 "Tampa Wind," created by Stacy Levy, covers a portion of the side of the four story Natural and Environmental Sciences Building. “Tampa Wind,” the creation of artist Stacy Levy, is made up of 3,000 steel discs of various sizes that shimmer in the sun and silently vibrate with the wind – all to make a viewer think of a specific body of water. "It's a rendering of a section of the Hillsborough River that passes through the eastern edge of the USF campus," Howard said. “It’s a great way to see a piece that incorporates something local and then incorporates the concept of the buildings and then the environment, fantastic,” Kristina Skeptin said. She was on the tour with a group of fellow art aficionados from Sarasota. We checked out a number of other pieces inside the Engineering and Sciences part of campus, including “Unspecific Gravity.” The one acre site includes a reflecting pool with a number of long poles ending with chrome-copper tops that resemble Mickey Mouse’s head and ears. "Unspecific Gravity," Doug Hollis' creation, covers one acre of space in USF's Engineering and Science area on campus. 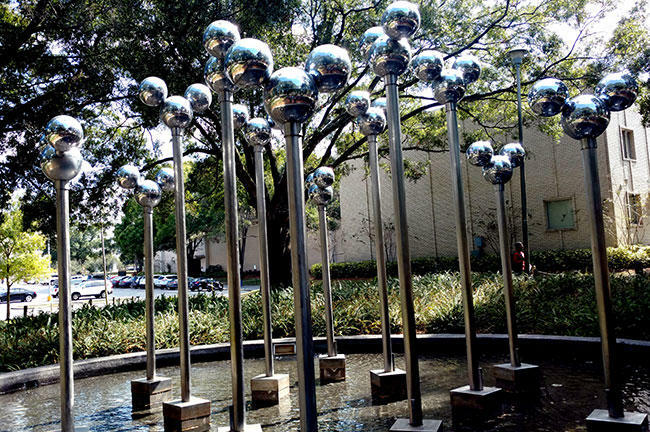 But that’s not what artist Doug Hollis was going for – the tops are actually fountains designed to represent a water molecule: one oxygen atom, two hydrogen atoms. The fountains don't actually function anymore. At first, they produced a fine mist, but the calcium level in Florida's water clogged up the fountains early on, and they've never been fixed. Now, the molecules stand there, silently reflecting the scene around them as jets quietly move the water in the reflecting pool below. Laura Meckling is a first year Master of Fine Arts Student at USF. The mixed media artist has seen many of the pieces while walking the campus on her own. The tour, she said, gives the stories behind the art that isn't necessarily found on a plaque. Ten minutes and one more stop later, we headed inside for the last piece on the tour – located at WUSF Public Media. 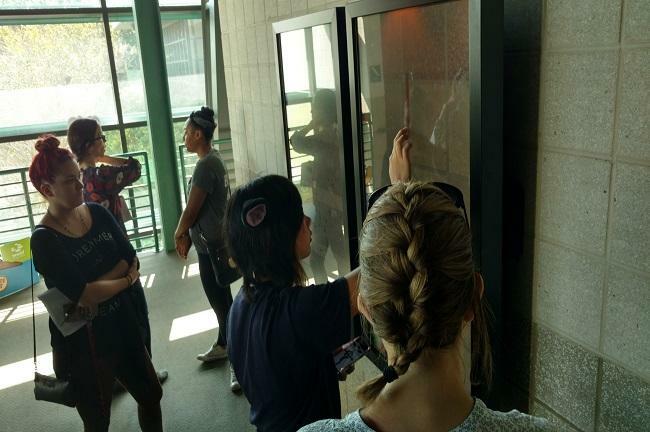 USF art students "paint" on "The Wall," Siebren Versteeg's interactive art piece located in WUSF Public Media's building. On the second floor landing between the TV and Radio buildings is Siebren Versteeg’s “The Wall.” It's a pair of 46-inch touch screen LCD displays where anyone can basically create digital graffiti using their fingers. “And then you can paint with whatever color you want and then you can also send the image to you or anyone else that you would like to send it to,” Howard said as a trio of USF art students drew and talked. When it comes to a personal favorite piece of public art on campus, Howard and I agree - it's a creation called "Solar Rotary," located between Cooper Hall and the Communication and Information Sciences Building. Artist Nancy Holt designed the work, which places a large aluminum structure that looks like a twisted swing set on a walkway inside concrete benches, with a smaller concrete circle in the center. Thanks to hundreds of hours of trigonometry equations performed by Professor Emeritus Jack Robinson and his students, at precise times throughout the year, five plaques commemorating certain events from Florida and Tampa history are framed in a perfect circle of sunlight. A meteorite segment believed to be 4.5 billion years old sits in the middle of Nancy Holt's "Solar Rotary." At solar noon on the summer solstice, the circle will be perfectly framed in sunlight by the aluminum sculpture inside the plaza. 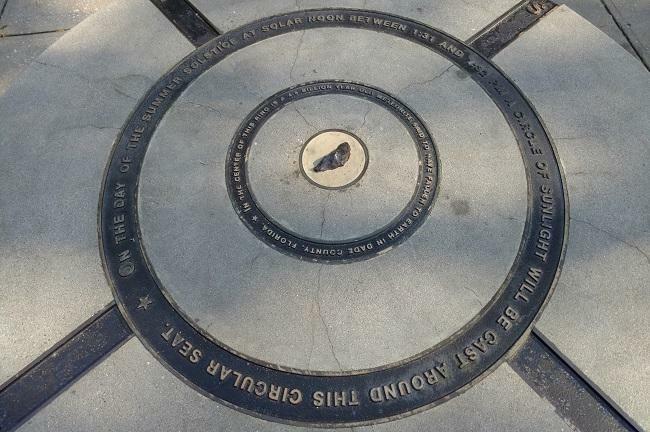 Then, at solar noon on the summer solstice (1:31 p.m.), a piece of a meteorite believed to be 4.5 billion years old embedded in the center concrete circle is perfectly surrounded by sunlight. She adds that the public tour is a reminder that instead of simply walking past a piece of art, people should stop for a moment and take a look. “We all need to kind of be more present about our surroundings and maybe to look at things in new ways, it might give us a sort of a new way to approach the campus, to approach art, a new entry point and access point,” Howard said. Howard currently conducts tours once a semester, with the next one scheduled for March 24, 2017. You can view a larger slideshow of the collection and vote on your favorite work by clicking here, and see a map with the location of a number of the pieces by clicking here. Commuting in Tampa Bay can be challenging. Often, drivers can get stuck in traffic and endure plenty of red lights. But in a few local spots, commuters are seeing those mundane gray signal boxes transformed into colorful, vibrant canvases. Traffic box art isn't a new thing. 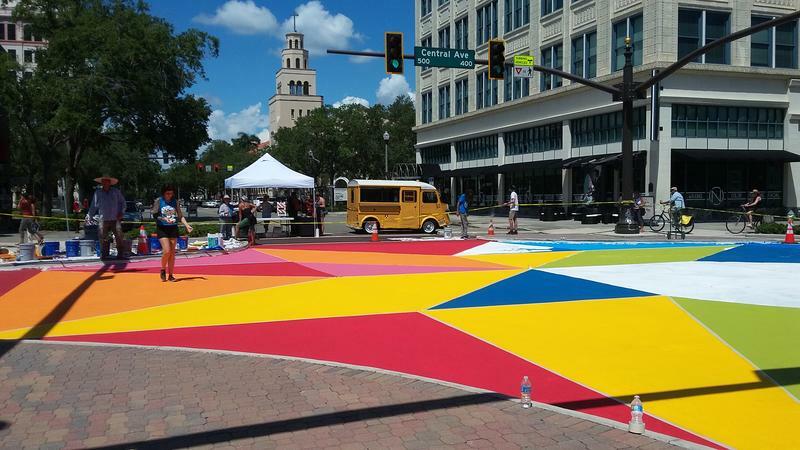 They’ve been successful public art projects in cities like Tampa and Fort Lauderdale. And now an arts group in Clearwater is jumping on the trend with a signal box public art project called "Thinking Outside The Box." WUSF is infusing a little fun in our news with an occasional series called “Art Populi.” The aim is to shine a light on Tampa Bay's rich cultural landscape-- and offer a perhaps welcome diversion from the political stories that can dominate during election season. Our debut collection of stories will focus on public art. We’ll be reporting on city murals, abandoned art, public art galleries and more. For our first story-- we traveled to a place in Pinellas County known as "Whimzeyland." When you think of St. Petersburg, what’s the first image that comes to mind? Time once was that answer was likely to be the Pier or the city’s famous green benches. Now, that answer might be murals. In the past few years more than 100 murals have been created and more are arriving all the time. 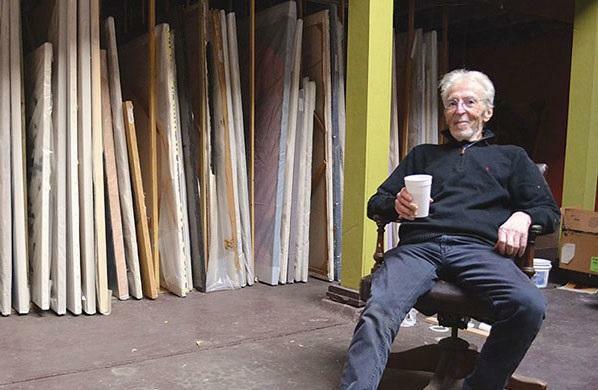 Margaret Miller remembers first meeting Theo Wujcik in 1972, when they shared the same office hallway shortly after both started working at the USF School of Art and Art History. Miller, now the Director of the USF Institute for Research in Art, would stay late, studying to become a curator. Wujcik would also burn the midnight oil, working intensely on portraits using the traditional technique of silverpoint on paper. Ann Wykell is a consultant to nonprofits and local government on public art. 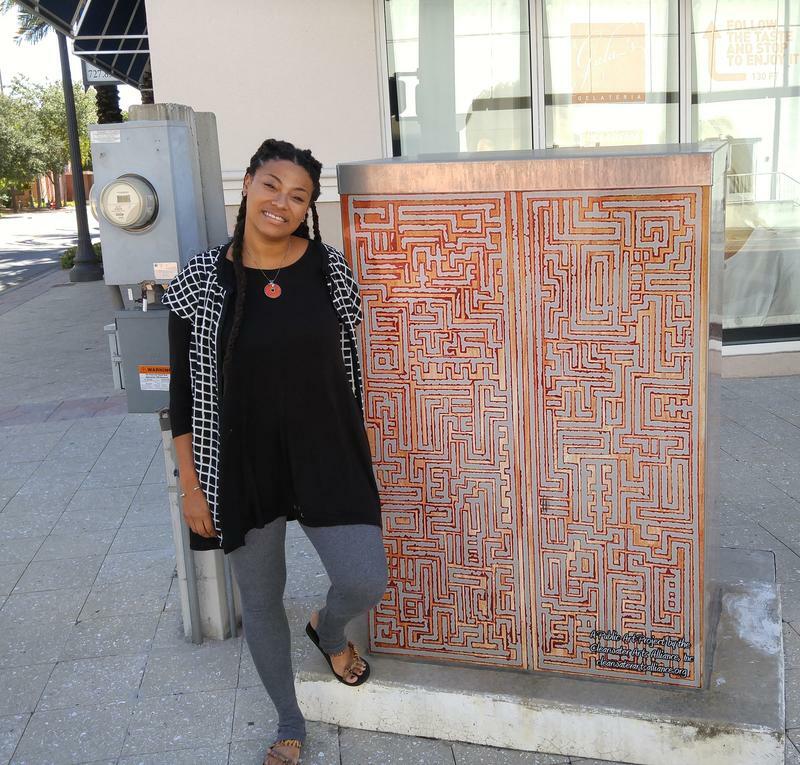 She's been involved with many public art projects in the Tampa Bay area. 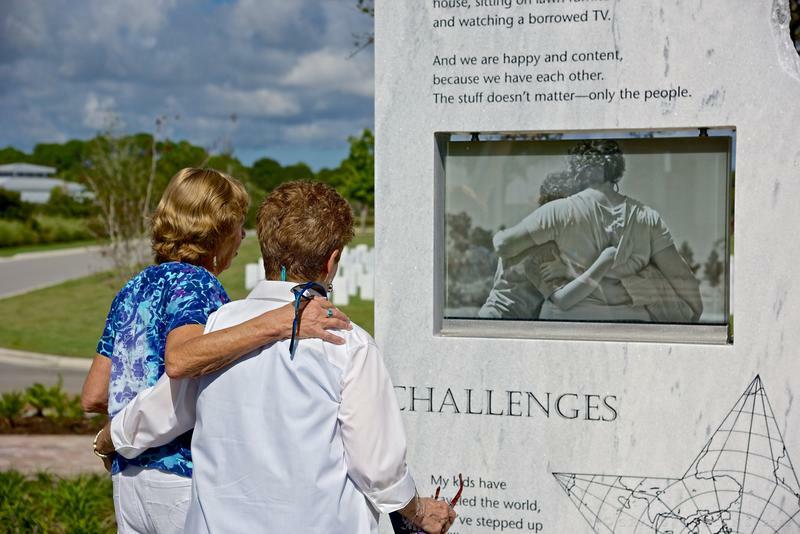 She developed and managed the art plan for Sarasota National Cemetery’s Patriot Plaza and established St. Petersburg’s first Office of Cultural Affairs. She's currently advising the City of St Petersburg on art selection for the Pier Park project. 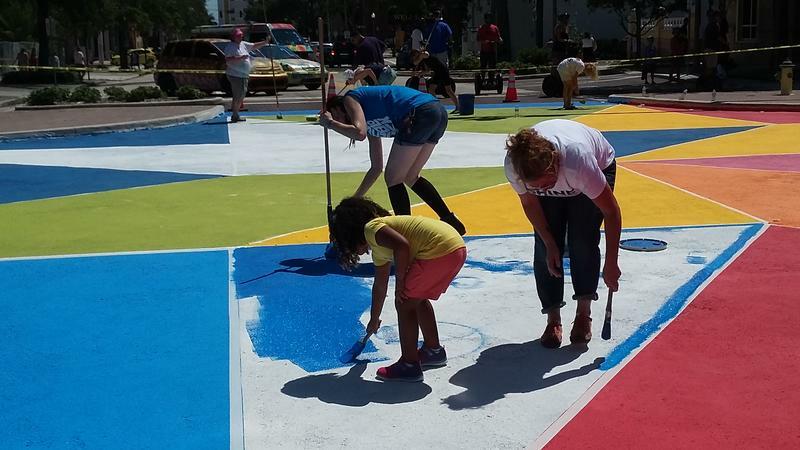 She spoke with WUSF's Lisa Peakes about government support for public art and what makes for effective projects. It might be that big beautiful mural you pass on the way to work. Or the bike rack that looks like a sculpture. Public art is all around us in Tampa Bay. When you walk around your community, are you getting a sense of vibrancy and creativity? If so, that may be because you're experiencing "public art." WUSF recently launched an occasional series called “Art Populi,” an occasional series that is focusing on public art. From city murals to street sculptures and free art, we're hoping to shed a new light on the Tampa Bay's art scene. For our second story, we follow two artists as they abandon their creations in Pinellas and Pasco Counties.